Air treatment for radiant systems | Giacomini S.p.A. Comfort means quality and healthiness of the environment we live in. In modern buildings, hermetically "sealed" because of energy efficiency reasons, it is key to ensure the proper air treatment and control hygrometric conditions. Paired with our radiant systems, we offer machines manufactured ad hoc to control humidity levels during summer months, to allow air exchange in the different environments and heat recovery. Monobloc unit for the control of the air humidity, compact and noiseless, ideal for the combination with radiant panels for cooling systems in residential applications. In this refrigerated unit, equipped with hydronic batteries that are supplied with the cooled water of the panels, the air undergoes a proper thermodynamic treatment to be strongly dehumidified and prevent the condensate risk. Versions with integration of sensible power and primary air treatment are also available. Monobloc air treatment unit, to be combined with cooling radiant systems, to make the functions of dehumidification, renewal, free-cooling, air-heating, integration of sensible thermal power In an easy and effective way. 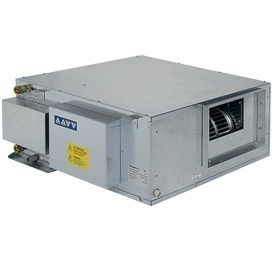 It is the evolution of the simple dehumidifier, combined with a counter-current air heat recuperator of high efficiency and a specific additional ventilation system. Per visionare e scaricare certificazioni e omologazioni, visita l'Area download.